2001 was the only year I ever went to the Cannes Film Festival, and looking over the year’s most significant movies I can see what an influence the experience had on my list-making – including the top slot. 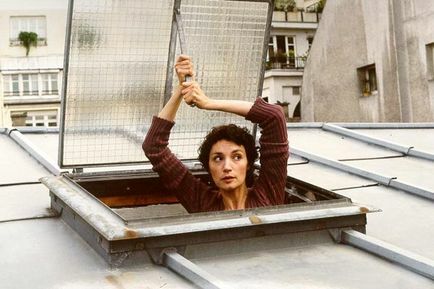 Almost a decade later, Jacques Rivette’s Va Savoir does not seem to have established itself as a towering work in the director’s career, nor did it make a huge impact on Best of the Oughts surveys. But seeing it at Cannes (not at the press screening but at its regular public bow, with Rivette in attendance) it looked like a breathless, suspended, wise masterpiece, made with no strain showing whatsoever. My 2001 accounting has many examples of the kind of international arthouse director who dominated the big film festivals at that exact moment, including some titles I saw first at Cannes. Ah, who could forget crowding into a small theater lobby (not one of the festival’s official showcases, but just a multiplex used for the many market screenings that happen during Cannes) and throwing shoulders and hips to hold your place in the grim jostle to make sure you got into a screening of…the new Jean-Luc Godard movie? Wow, this thing must have box-office smash written all over it, right? I liked Éloge de l’amour pretty well, as it turned out, and it held up again a year later, when it finally came to open in the U.S.
Godard takes a swipe at Steven Spielberg in that movie, but Spielberg got the best of him this year. I saw A.I. twice in the same week, and it remains a evocative experience, with the ghost of Stanley Kubrick’s original plan for the project still in evidence; the eerie performances by Haley Joel Osment and a phlegmatic teddy bear contribute to the effect. And David Lynch’s Mulholland Drive turned out to be a double-dipper for me as well: when I watched it at a regular press screening early in the year I thought it was not-quite-digestible Lynch; then seeing it again in an empty house on a dark night later in the year, it scared the bejeezus out of me. It’s an open system (in a way Lost Highway, for instance, is closed), a mystery that sends its tentacles out in a thousand directions. Yet somehow it is utterly lucid. It was a year for complicated, elliptical, ambitious pictures, so let me explain a couple of exceptions to that rule. Lagaan and Ghosts of Mars both transport the viewer into something close to the original building blocks of film language, with glorious results. Lagaan is a near-four-hour Bollywood picture that might have been made by someone who had only recently absorbed the basic storytelling tenets of D.W. Griffith. It is about cricket, a sport that, as an American, I know absolutely nothing about. But watch this movie and you will be stomping your feet in fervor, because during its final hour nothing else in the world will matter to you except the defeat of the rotten British cricketeers by the plucky Indian upstarts. On some level – not an exclusive level, but an important one – movies were made to do this. Ghosts of Mars is just a John Carpenter B-movie, but I admire it for exactly that – for the getting right of certain fundamentals, executed with grace under budgetary pressure. But what has Carpenter been doing since making it? Obviously the #10 spot stands for that raft of international arthouse titles, but one could also make the case for Michael Haneke’s The Piano Teacher (Isabelle Huppert putting other actors of her generation on notice), Shohei Imamura’s Warm Water Under a Red Bridge, Claire Denis’s Trouble Every Day, Nanni Moretti’s The Son’s Room, Kiyoshi Kurosawa’s Pulse, and Guillermo Del Toro’s The Devil’s Backbone. Jacques Audiard’s Read My Lips was a beautiful piece that kicked off the excellent decade he had. Also in that category, it was a slightly off year for Hou Hsiao-hsien (Millennium Mambo) and Mohsen Makhmalbaf (Kandahar), though both movies have interest. My list at the time had The Tailor of Panama, directed by John Boorman from the le Carré novel, which I still think is terrific even if it stumbles in its final reels. A couple of overlooked comedies I liked a lot were Jesse Peretz’s The Chateau (with hilarious turns by future Apatow players Paul Rudd and Romany Malco) and Brian Helgeland’s A Knight’s Tale, which works nicely on its own peculiar terms. I never quite warmed up to Gosford Park or The Royal Tenenbaums, even though they contain many nice things, and someday I will watch The Man Who Wasn’t There again, a film that missed traction the first time around. There was a lot of love for Y Tu Mama Tambien at the time, another movie I don’t esteem as much as the general consensus. Credit is due to Jill Sprecher’s Thirteen Conversations About One Thing and Rose Troche’s The Safety of Objects, a pair that rhyme in my memory, and good times were had by Terry Zwigoff’s Ghost World, Richard Linklater’s Waking Life, and Nicole Holofcener’s Lovely & Amazing. Crazier outliers include Arliss Howard’s Big Bad Love and Billy Morrisette’s Scotland PA, both cockeyed literary efforts. And the year is not complete (although the year in question was probably 2004, when it was generally reviewed, but IMDb has it as a 2001 minting) without The Lost Skeleton of Cadavra, Larry Blamire’s send-up of a certain kind of Fifties monster movie – the kind of thing that people tend to get completely wrong, but this movie gets completely right. Like to commenter above, I think it’s a very interesting list, with a lot of titles I haven’t watched yet. Isn’t the Devil’s Backbone by Almodovar, rather than by Del Toro? I’ve known about it for years but I’m too scared to watch it. Also, The Son’s Room would be much higher if that list were compiled by me. Y Tu Mama blah blah never entered my heart either and it’s still not one of my favorites. Lastly, thanks for the list and I’ll be checking out a few of the movies in it. The Devil’s Backbone is Del Toro, albeit working in Almodovar’s homeland, Spain. But you are right to be scared to watch it…. What are your thoughts on Hayao Miyazaki’s “Spirited Away”? In your review, you mentioned that “Ponyo” is one of your favorite films by Miyazaki. A few critics have not responded to his films as positively as much as popular consensus may indicate. If this is true regarding your opinions on Miyazaki’s work, have you seen “Nausicaa of the Valley of the Wind”? It wonderfully displays the complexities and desperations of different groups in an environmentally failing world. There is also an essay on “Nausicaa” featured in the “Far-Flung Correspondents” section of Roger Ebert’s website if anyone wants to learn more about the film. Japanese animation is not something I am really disposed to for some reason (feel the respect, but maybe not so much the love), which has much more to do with me than with the animation. Spirited Away is an inspired film. I have not seen Nausicaa, but thanks for the recommendation. I’m always jazzed by your lists, Robert, but would differ a tiny bit. “Gosford Park” rates much higher for me and so does “Pulse”. Although there was much to admire about “A.I.”, I found the inane ending blighted the film for me. Totally thrilled that “Late Marriage” is on your list. A truly wonderful film that has stuck with me all these years and I never hear anyone mention it. I haven’t seen the Carpenter, so I will be checking that out asap! Ditto Rivette! Keep those lists coming! Surprising list this time around — you missed my top three entirely, plus several other favorites. Moulin Rouge is my favorite of the year and possibly the decade. Fellowship of the Ring was the most intimate of the trilogy. And Spirited Away is my favorite Miyazaki film, non-stop visual wonder that is always rooted in great characters and ideas. Speaking of visual wonders, Amelie is drop-dead gorgeous, and Black Hawk Down turns war into a terrifying symphony. The Others is a ghost story with a stately elegance. I haven’t even tapped into my second tier yet, where I would echo your appreciation of the wonderful Read My Lips and others’ appreciation of Gosford Park. It’s unfathomable that many of these could miss my own theoretical top 10 list, but now here you are with a list of 12, 10 of which I haven’t seen yet. My average is usually a whole lot better, but this way I get more recommendations from you. Where I’m particularly deficient is in the latter-day works of the French New Wave directors (other than Truffaut, whose work I’ve seen almost all of). I’m catching up; working my way chronologically through Chabrol now. It is fascinating to me that so many of them are still around, still doing what they do. Thank goodness for that.